My very favorite part of the weekend is my regular trip to the local Farmer’s Market on Sunday morning. I usually round up a few friends and we walk from our houses to our neighborhood market, which is a little over a mile away. It’s a great way to get moving first thing on a Sunday morning and I always have the freshest groceries for the rest of the week (not to mention that sampling is the perfect breakfast!). It’s always fun to see how the produce changes from season to season. In the fall and winter, I scoop up pink lady apples, sweet potatoes and Brussels sprouts (click here to see our Fall Farmer’s Market Grocery List). But in the summer months, there is a completely different assortment of fruits and veggies to choose from. The other day I did a little research to find out what produce I should be taking advantage of this season, and I thought you would all like to see the list I came up with. Asparagus hits its peak season in April, but you can find fresh bundles of this green veggie up until June and July. Fresh asparagus will be bright green with no signs of shriveling, and the tender tips should be firm, never mushy. This folate and potassium rich veggie is a great side dish to prepare alongside fresh summer fish or poultry, and it’s delicious in a summer pasta or veggie scramble too! There’s a reason why you start to see “summer squash” pop up on seasonal menus in restaurants everywhere this time of year. Zucchini and its yellow summer squash counterpart hit their peak season from June until late August, so you’ll find this veggie at your local market during the warmer months of the year. Zucchini has high water content, so it cooks quickly, and it also tastes delicious raw on a crudités platter. We love using it to make this Summer Boot Camp approved low-carb lasagna. Farmer’s Market tomatoes can be some of the most beautiful produce at the entire market. If you keep an eye out for heirloom tomatoes (ones that are variegated colors of red, green and yellow), you’ll notice how their funky shapes and color combinations immediately catch your eye. There are so many ways to use this red fruit in the kitchen, so be sure to scoop up plenty of heirloom, cherry and classic beefsteak tomatoes. And if you do choose cherry tomatoes, take a peek at our favorite Truffled Avocado, Tomato and Hearts of Palm Salad for instant recipe inspiration. 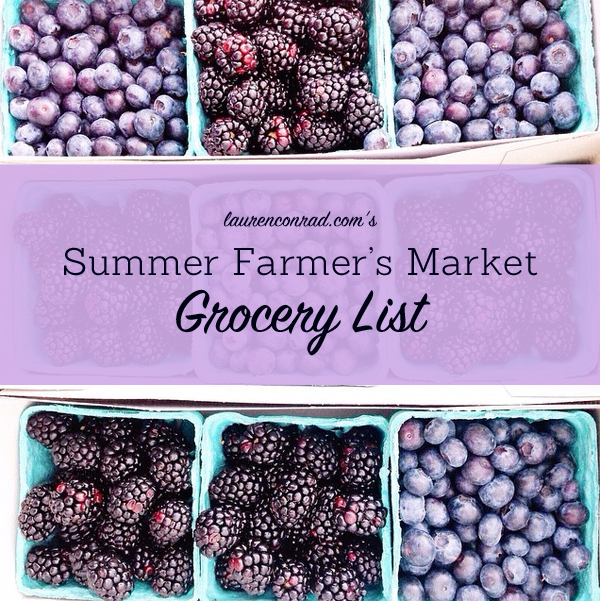 We’re talking cherries, blueberries, boysenberries, and strawberries here. These antioxidant heavy hitters are a great, low fructose summer fruit to add to smoothies, desserts, or simply eat plain. To make yours as long as possible, store them in moisture-proof container single layer for up to five days, and don’t wash them until you’re ready to eat. Click here, here and here for three of our favorite decadent blueberry recipes. Confession: peaches and nectarines are my all-time favorite fruits. They are #1 in my book. So whenever summer comes around, I get so excited to bring home weekly bundles from the market. I always put together a mix of peaches that are ripe (strong peachy smell, soft when you grip them), and ones that aren’t ripe yet (firm, fainter peachy smell) so I can eat them throughout the week. Bell peppers are a classic summer produce staple. Whether they’re mixed in with Mexican fajitas or you’re dipping them in fresh guacamole, bell peppers add a pop of color and flavor to your summer palette. When you’re browsing the selection at your Farmer’s Market, choose peppers that feel firm and heavy for their size, and look smooth, shiny and blemish free. Take a peek at our favorite Stuffed Bell Peppers recipe here. Green beans might seem like a Thanksgiving dinner staple, but their peak season is actually May through September. Select brightly colored, smooth and unblemished green and wax beans that are crisp enough to snap when bent in half. You can steam them or boil them as a summer side dish, or mix them into a stir-fry dish. Fresh watermelon hits its peak between June and August, so now is the time to scoop up this quintessential summer fruit. Choose the best melon by finding one that’s firm, symmetrical and unblemished without any cracks or soft spots. Cantaloupe and honeydew are also great summer fruits, so I highly recommend picking up the entire trio while you’re shopping. For a sweet and savory dish, use your fresh watermelon to make this Watermelon, Feta & Mint salad. I’m sure you’ve noticed that basil is available year-round in supermarkets, but it’s freshest during the summer. To find the best batch at your local Farmer’s Market, look for a bushel that is not wilted and doesn’t have brown spots. And since you’ll be picking up some fresh tomatoes too, you can use both ingredients to have fun dreaming up a fresh dish at home, like this Tomato, Basil & Bowtie Pasta Salad. I have yet to find a better combination of flavors than a burger, watermelon and sweet white corn on a Fourth of July barbecue. But you don’t need a celebration in your future to have a reason to add some ears of corn to your shopping list. Corn’s peak season is May through September. And to find the best corn, make sure the husk has nice deep brown silk tips (but you don’t want the husk to be completely dried up). Use your corn to make this Black Bean & Corn Salad (which is Summer Boot Camp approved) to serve at your next summer soirée. What fresh fruits and veggies do you love to buy this time of year?